Finally the month of Ramadan is here. The days are long and the fasting is tough, but we are persevering. 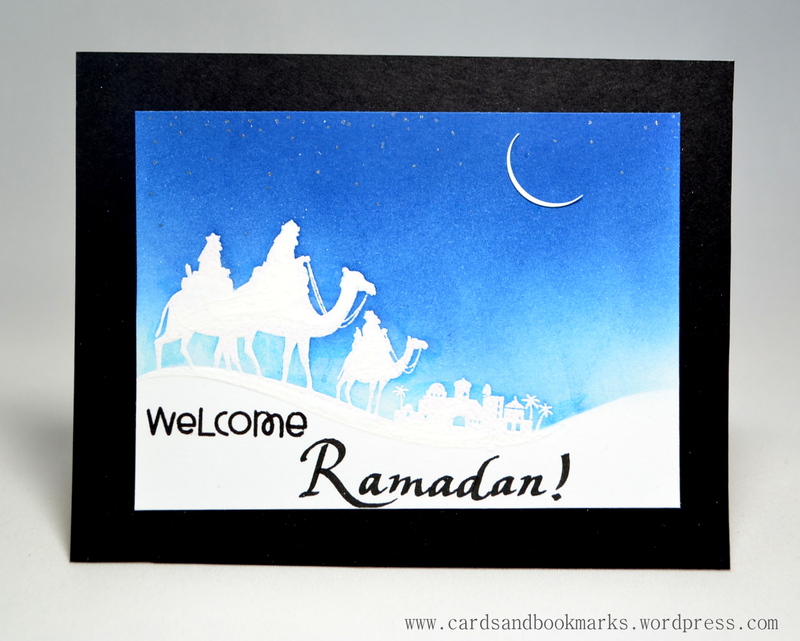 I wanted to make a card welcoming Ramadan. Coincidentally, my husband asked the other day if I could make a Ramadan card for his friend. I told him I was just about to do so myself, and went on to work on this card. Truth be told, it is not at all what I was hoping for it to be. In fact, this was the third attempt! I wanted to remove the clear embossing in the end with a hot iron, so that all the white areas would have consistent level and texture. But that didn’t work well at all, in the end (on my third card) I decided to leave it as is. Then there were times I messed up the sponging, making smudges. And the embossing wasn’t working for me well either in terms of coverage. I was getting ink inside the silhouette area which looked terrible. So I ended adding white paint on top which added more to the texture! exactly what I was trying to avoid! I didn’t show this in the video, but later on I cut out the middle portion of the card and mounted it on a 4.25″ by 5.5″ black card stock. It was my husband’s idea! said the contrast would make the men look more prominent. Ink: Close to my Heart “Moonstrack” and Black, Sakura clear stardust gel pen. This card is beautiful! I love how it turned out, and I am very often a 3rd or 4th attempt cardmaker! I wish I was less messy because the stray fingerprint seems most often to lead to my undoing…. It was worth all the hard work, because this card is so pretty! The blending of the sky is fantastic!